Peruvian cuisine, is a up and coming sensation. With dishes such as ceviche and the thrilling taste of leche de tigre, the fresh seafood delicacies stay on your mind long after you’ve left the country. But with such a broad amount of options, it can be hard to choose the best street food to try out in Peru. He’re we’ve gathered the best locations in which to revel in South-American fare. No matter what day of the week you stop by La Lucha in Miraflores, you’ll find a long line of customers waiting for their turn to experience the melt-in-the-mouth sandwiches on offer here. La Lucha literally translates to “The Struggle” – the drive to succeed is a common quality in the Peruvian culture – and its the reason why their cooks go to work and make such delectable creations everyday. Looking to dine like a king without spending fortune? You’ve come to the right place. Al Toke Pez is a hole in the wall – but don’t let that scare you away. 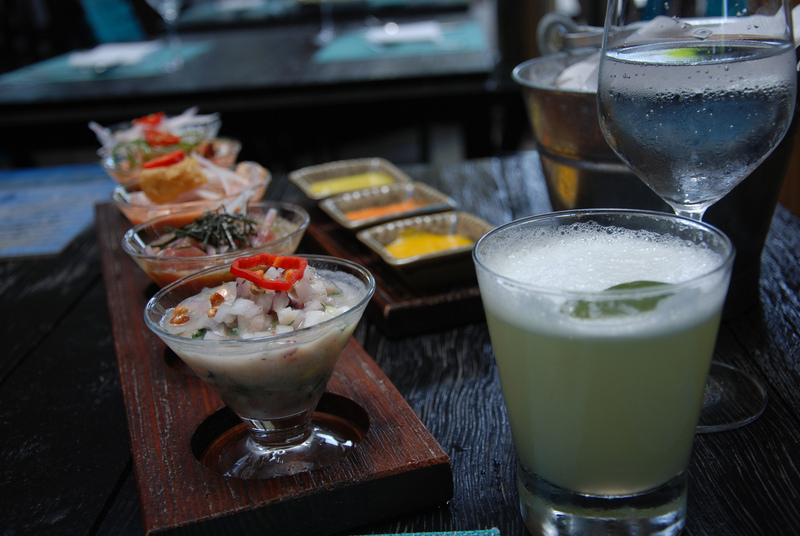 This spot provides a perfect example of why Peru is known for its exquisite cuisine, and once you’ve grabbed a spoonful of ceviche you’ll see why. Their premise is to sell excellent quality food that everyone can have access to. Unfortunately, only six spots are available at the counter, so get their early to avoid the lunch crowds. Six street food stalls put together form the famous Huerta Chinén. The spot is run by Angélica Chinén, who is possibly one of the most loving Peruvian cooks you’ll find during your trip. From Monday to Friday she offers the “classic” menu, which includes chicken with rice, carapulcra, chanfainita, patita con mani or mondonguito, for less than three dollars. On weekends, she goes all out and offers typical Peruvian plates such as duck with rice for less than seven dollars. If you love to feel at home when you’re having lunch, this is a must stop on your holiday. Pedro Peves used to be a mechanic who discovered that he could roast meats right on his cilindrada. For years, he cooked chicken, turkey and pork for his family until he decided to take a leap of faith and started offering his exquisite plates to curious costumers who wanted to try something different. Get here early, because when it’s time for lunch, La Cilindrada de Pedrito gets really crowded. You’re probably wondering what anticuchos are… But are you ready to hear the answer? Anticuchos are cow hearts on a stick -and even though it might not sound all that great, you’ll get addicted to them once you’ve tried them. The ones Grimanesa Vargas prepares are, quite possibly, the most famous in all of Peru. Locals call her la reina de corazones (Queen of Hearts) and she has been working in the kitchen for almost 40 years. This spot needs to be on your bucket list. Everyday, costumers ask Ronald Abad about his special secret when it comes to cooking his famous ceviche. He answers without hesitation – asides from the traditional ingredients, he adds white pepper, garlic with celery, kion juice and stew made from the head of the fish mixed with milk. The result will be your new favorite dish on the planet, and all for less than six dollars. 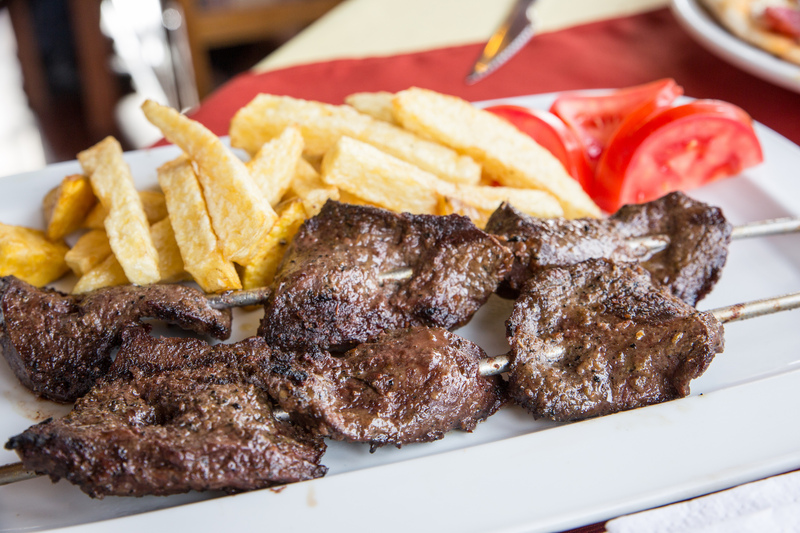 Anticuchos are part of the recipes the African slaves created during the Virreynato times in Lima, when they had to learn to cook the leftovers their owners gave them as dinner. Now, they’re part of Peru’s traditional cuisine and a dish you have to taste in order to get a feeling of what Peruvian cooking is all about. Around 7pm, dozens of people start to gather outside Doña Pochita’s food stall, where she fries the cow hearts and serves them to her clients with aji colorado, vinegar and garlic. Alberto Pérez Palma is the owner of this spot that specializes in causas rellenas, which is part of the traditional Peruvian cuisine you have to experience while you’re in Lima. Causas rellenas are made with potatoes, yellow pepper, mayo and lemon. At El Caserito they can be filled with chicken, red meat, fish, vegetables and anything you can think of. 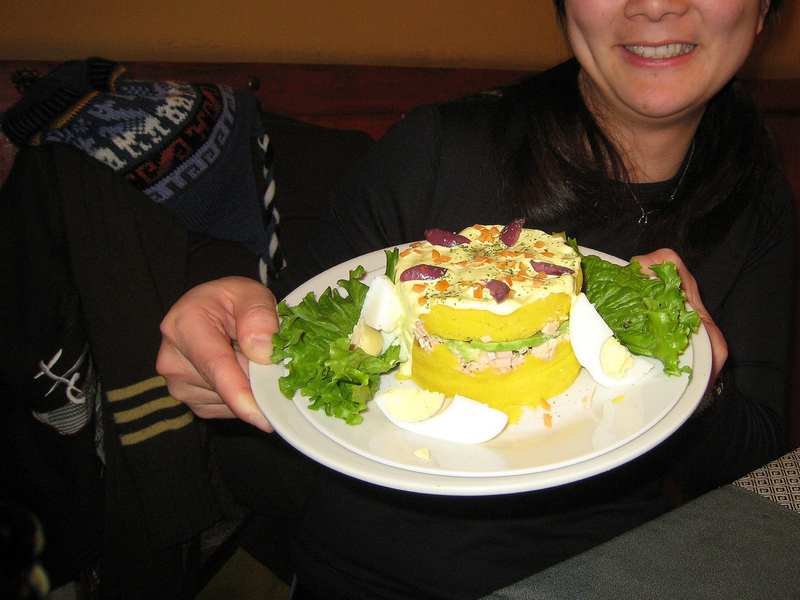 The most sophisticated causa is filled with shrimp, and you can enjoy one for just four dollars each. In 1960 Don Félix opened up a sanguchería in downtown Lima. The quality of his ingredients and the flavor of his sandwiches made this a hot spot in Lima. At El Chinito, presidents and ministers mix with doctors and policemen; this is a place where everyone feels at home while they enjoy a truly traditional Peruvian sandwich. Since Don Félix passed away, the tradition has been carried on by his children and grandchildren. 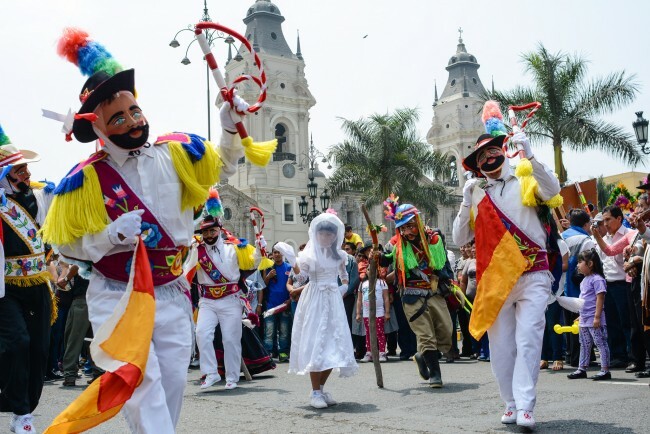 Miraflores in Lima is known for gourmet restaurants, up-scale cafes and tasty sandwiches. But what most of people don’t know is that the best picarones in town can be found right in the heart of this neighborhood. 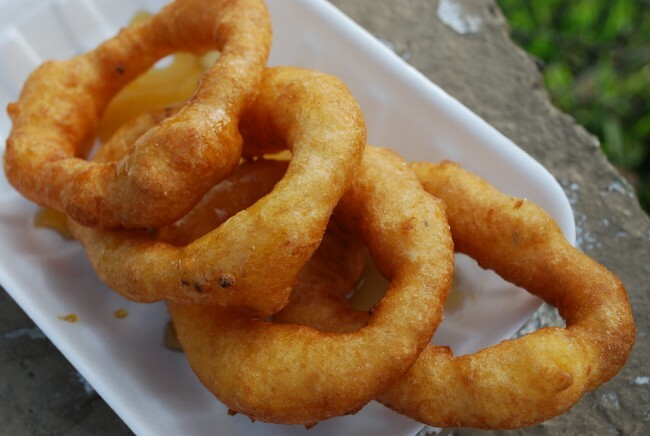 This traditional sweet is made of rings that look like donuts, but no donut can compare to this flavor. Prepared with sweet potato and squash, the picarones are later dipped in different syrups. At Parque Kennedy, Jhosimar Valverde runs Picarones Mary. With a small stall, she has won over every heart in Lima. Address: Picarones Mary, Parque Kennedy, Miraflores, Lima, Peru.